As I was starting my review for May I realized that I never posted the month in review for April. It may have been that I was a little busy around the month end (see here) which took my mind elsewhere for a few days and I never actually realized my oversight until just now. April, after all, was a pretty big month for me. 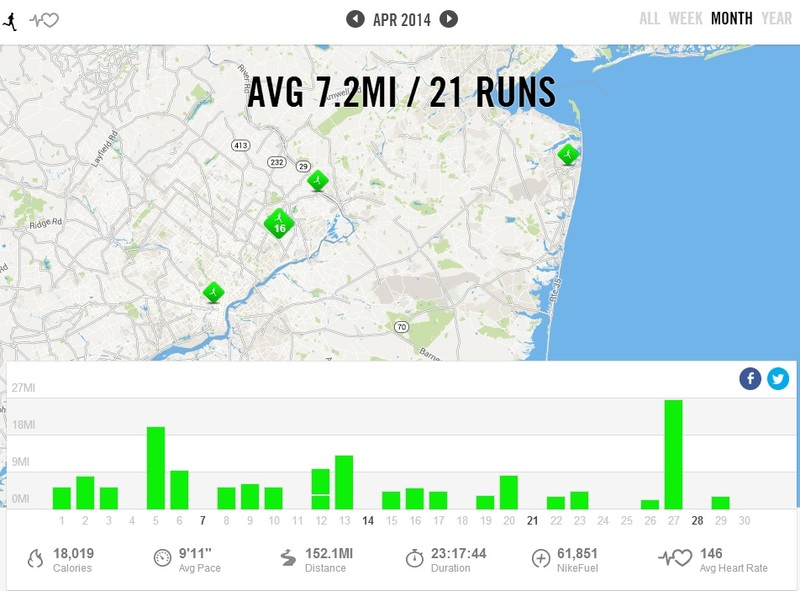 My monthly stats show 152 miles but that is not the whole story for the month. 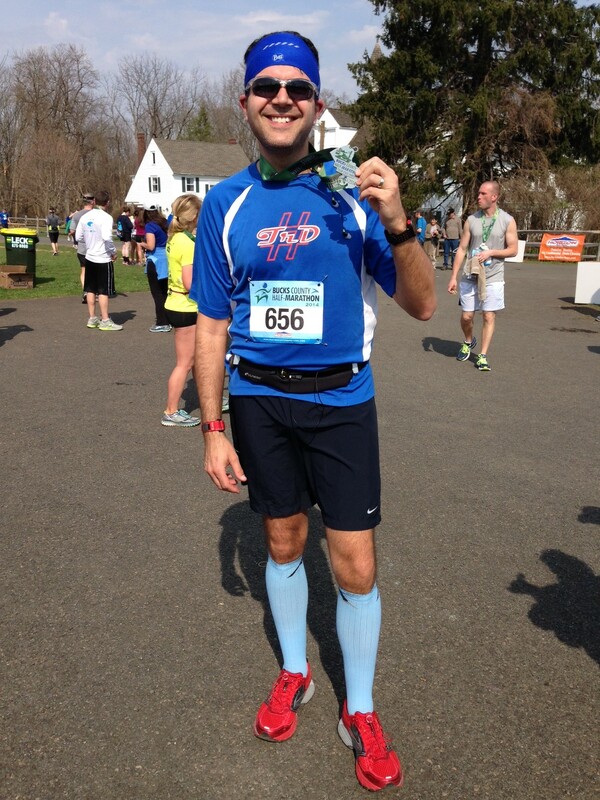 I set a new Marathon PR (3:54:30) at the New Jersey Marathon. 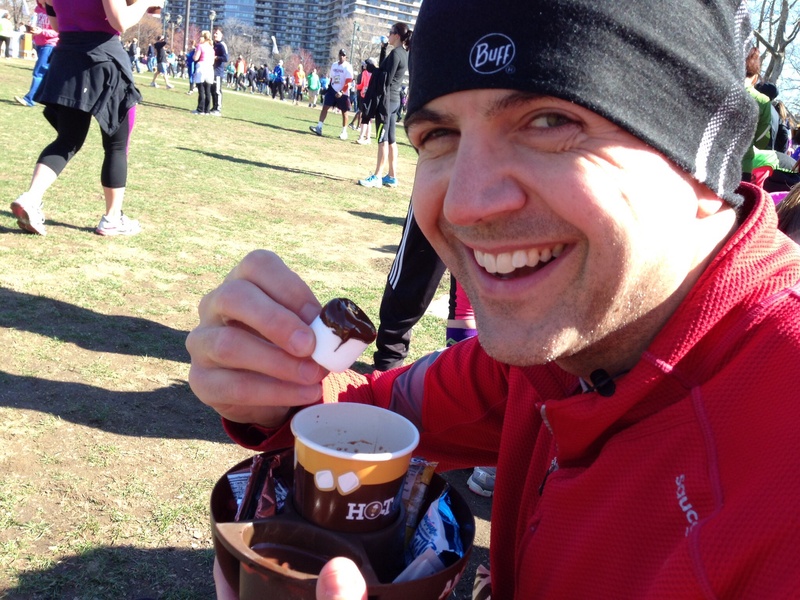 In addition I ran a the inaugural Philadelphia Hot Chocolate 15K and the Bucks County Half Marathon. 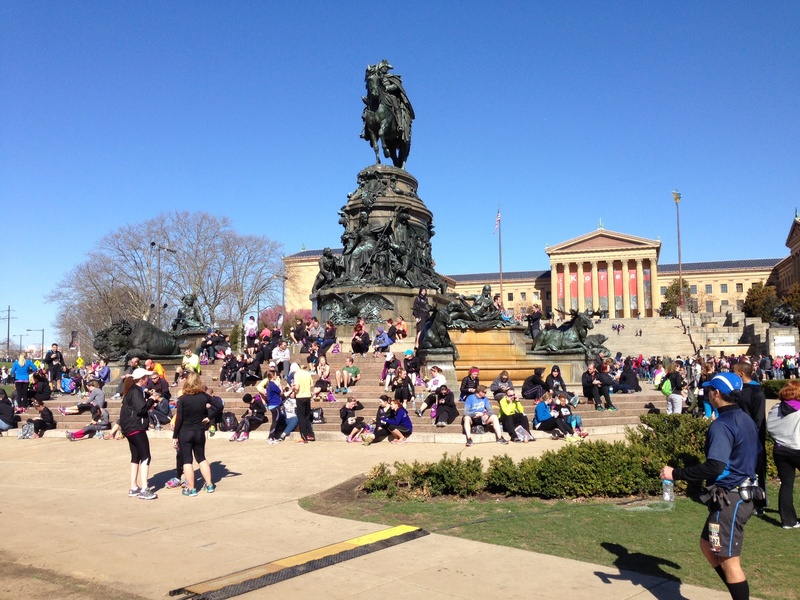 With the inaugural Philadelphia LOVE Run back on March 30th this made for a very busy few weeks of training and racing. The cool thing about that is that all my race times were around my marathon goal pace so I actually went into the marathon with confidence. All the hard work paid off. I was a very happy fellow for a few days…until I had to take about 10 days of unforced rest. 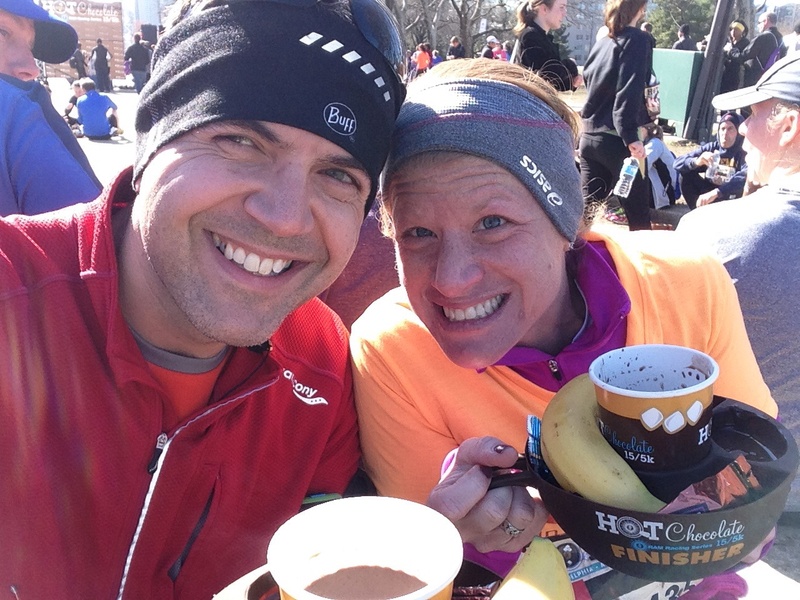 What else…oh yes, my wife and I signed up for the Baltimore Running Festival. 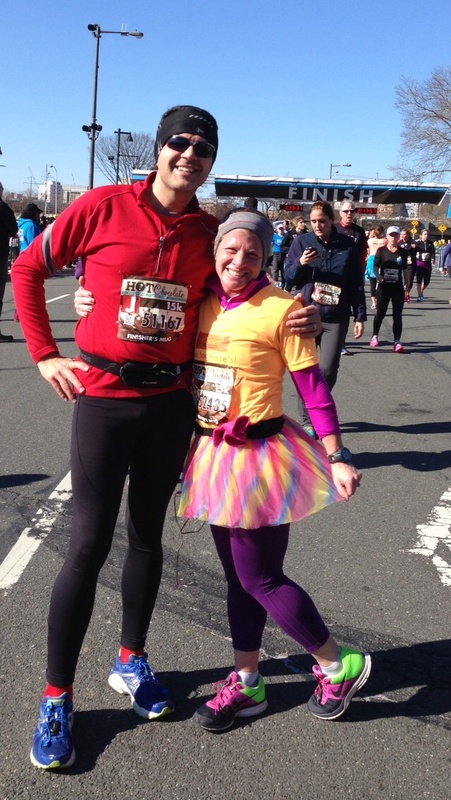 We will be running the Baltimore Marathon together. 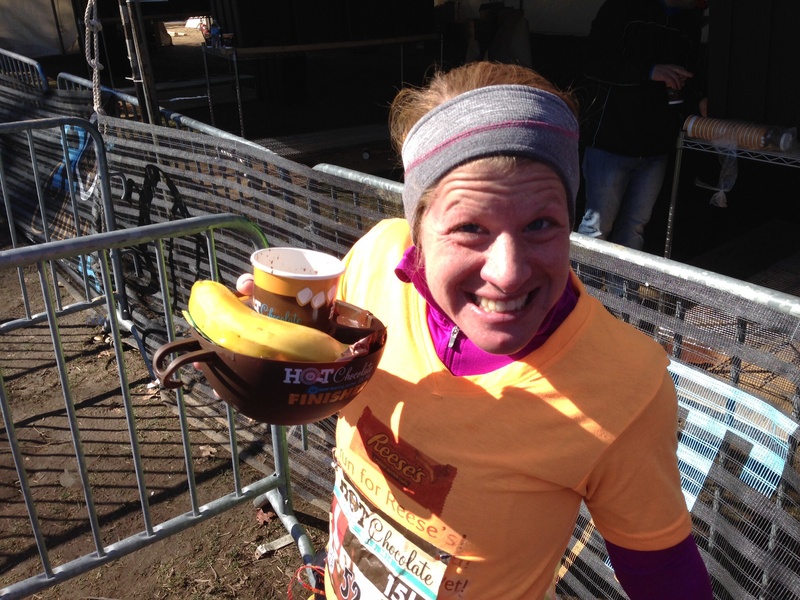 My hope is that we can bring her marathon PR down further. I’m confident she can. 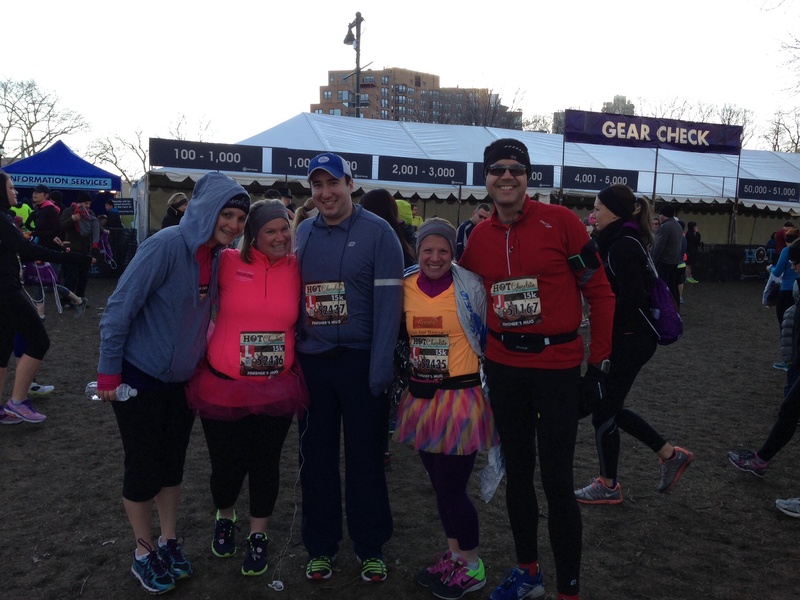 We also signed up for the 2014 Rock and Roll Philadelphia Half Marathon. 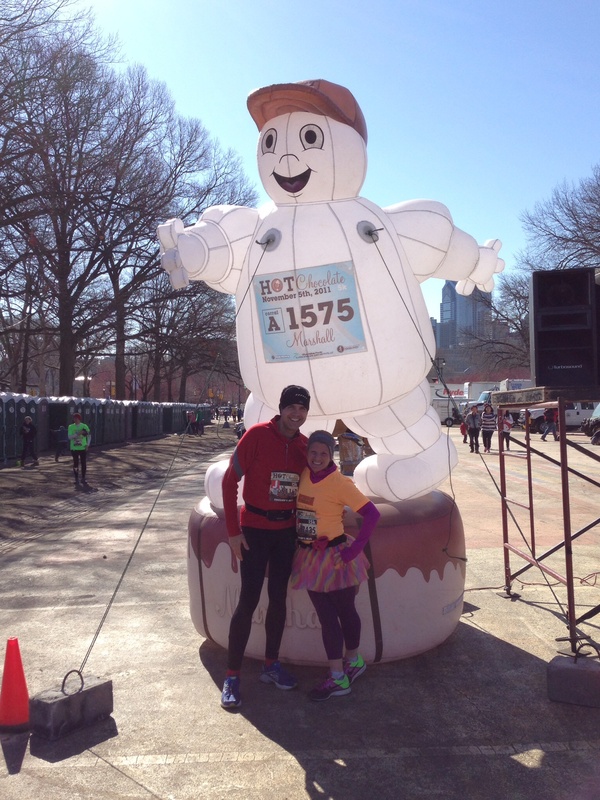 I was hesitant to do this again as I have run it for the last 3 years and we had discussed skipping this but for some reason we decided to give it another chance this year. After all, we have a family wedding later this year and we want to look good in the pictures. 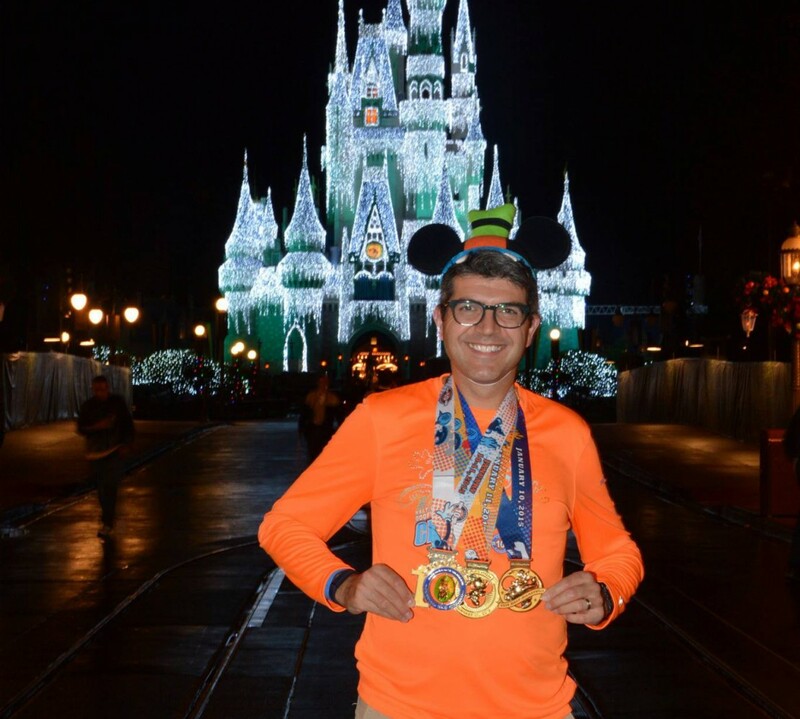 April was also registration time for the 2015 Walt Disney World Marathon weekend. 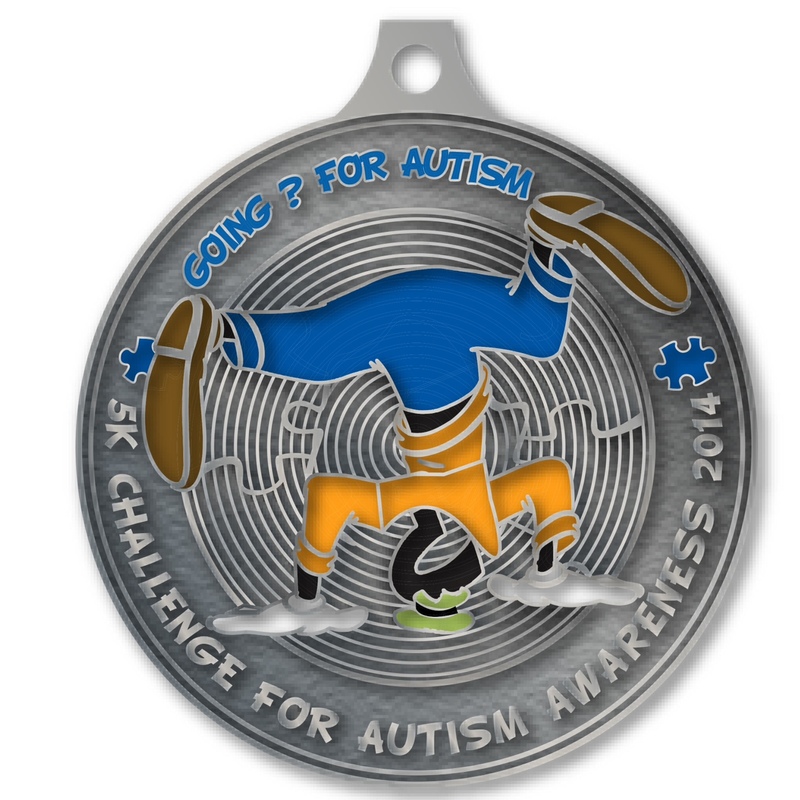 Again I signed up with Team Up/Autism Speaks for a third year but this time ‘just’ the Goofy Challenge. 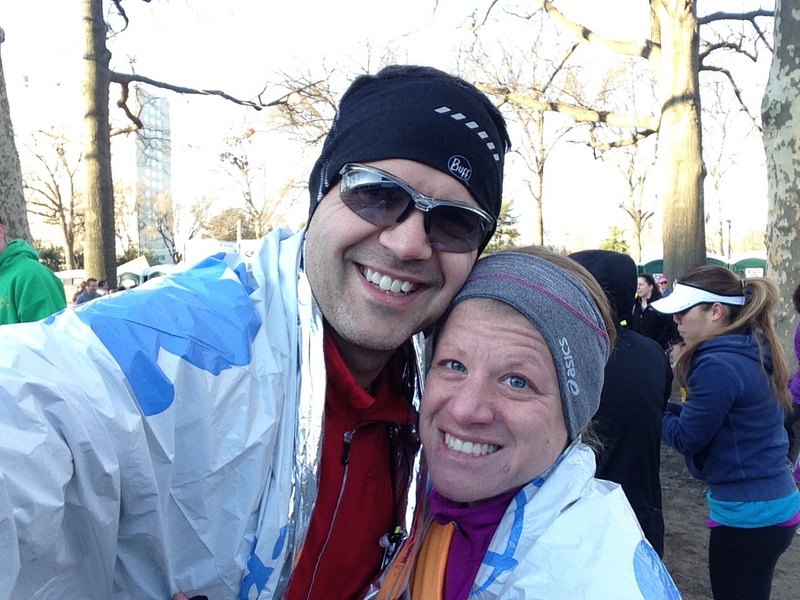 My wife also signed up with Team Up so we are fundraising together (harder than training if you ask me). As part of our fundraising efforts we are running two virtual 5K fun run/walk events. This proved both popular and successful for me last year and we are hoping for the same this year. 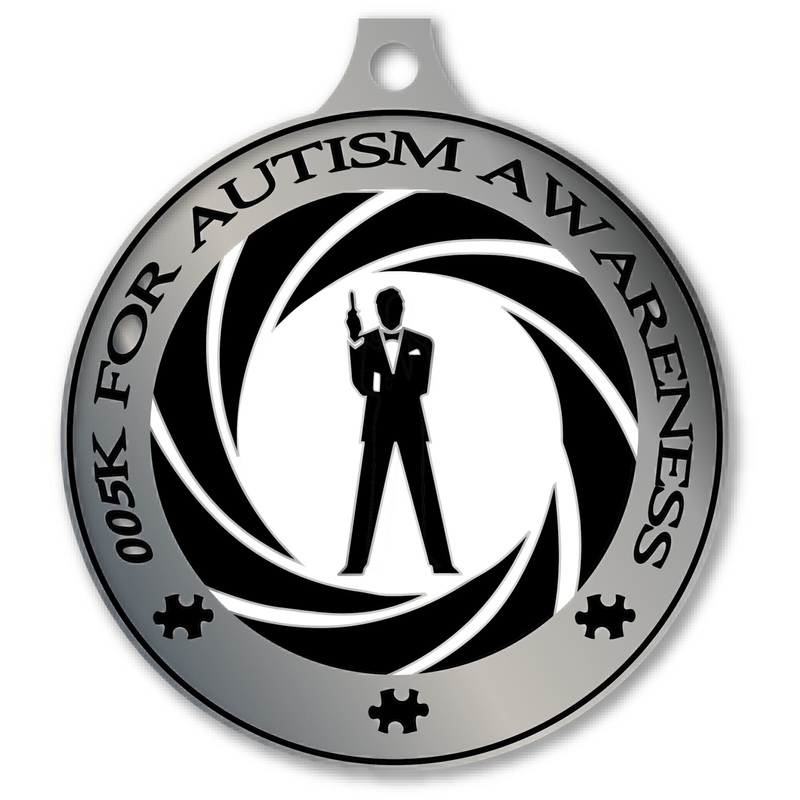 We actually have some really great medals and vendors have been generous to offer some cool prizes for participants this year. I hope you take a few minutes to take a look, perhaps join in one of the events and please do share this with your friends/running partners. It should be fun. Here are the medals designed for the events. 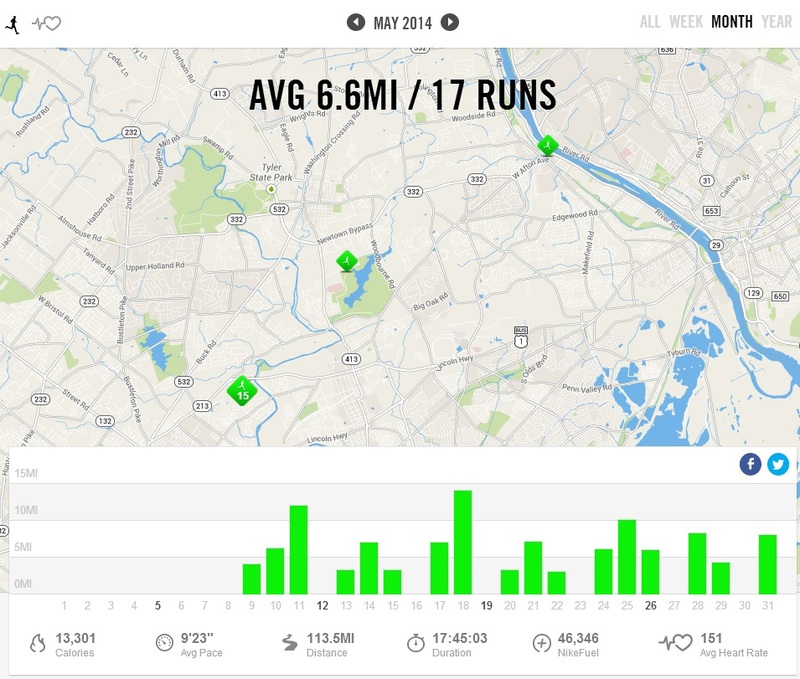 With a rather abrupt end to April (running wise) and a short break in training in May I had some ground to make up…well, really I was antsy and wanted to get back out there ASAP. Here is my recap for May. I still managed to get 113 training miles in during the month and was very grateful to be able to do so. The weather outside in May has been glorious. Yes, there have been some cool mornings but with the exception of a couple of rainy runs it has been great to be outdoors in the early mornings as the sun is rising and get my runs in. Now that I am training using Hal Higdon’s Intermediate 2 training program my weekday mileage has crept up a little. I’m glad for the extra sunlight so I am not so reliant on the headlamp right now. 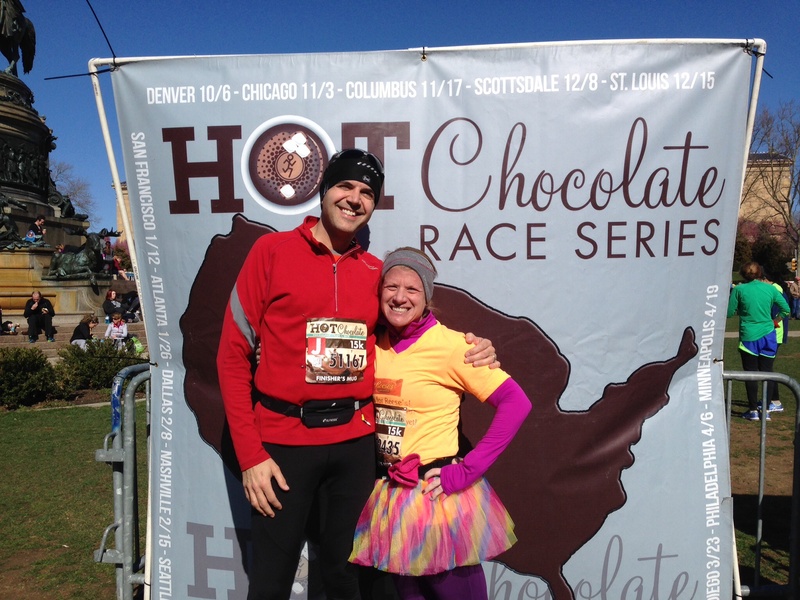 My wife ran in a couple of races this month. 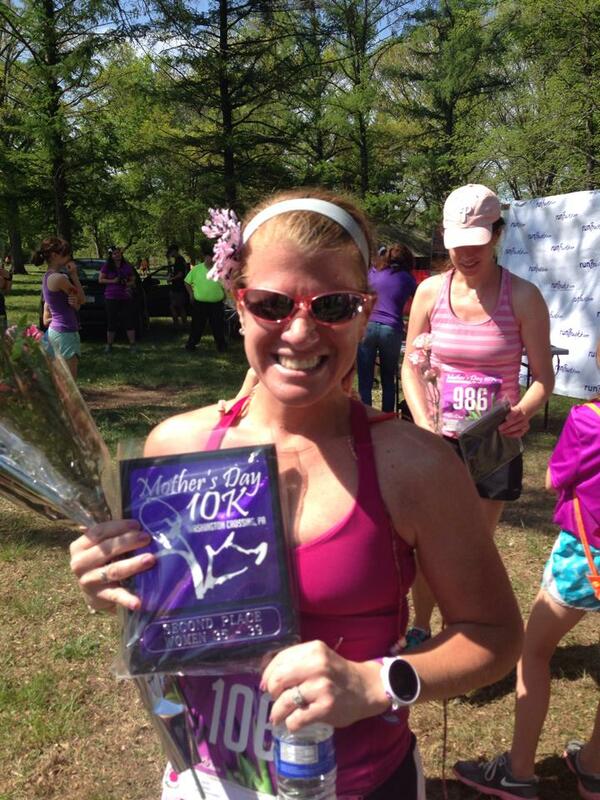 Early in May she ran a new PR at the Broad Street Run 10 miler in Philadelphia and on Mother’s Day I signed her up for a local 10K where she came back with a 2nd place age group finisher award. Go Shari!!! I’m a big fan (when I can keep up with her). The rest of this month has really been focused on managing the new training program and the increase in mileage. I am trying to follow the program diligently and doing the pace runs before the long runs. So far so good. Holding about an 8:30 min/mile pace on the hilly course where I train so I’m pleased with that. On Memorial Day I finally took the bike out for my first ride of the season. I’m pleased to say that I got in 20 miles and felt comfortable. I have signed up for a third year now for the Cycle Bucks County riding event in June so I’m looking forward to that. I think 25 miles is my comfort level when it comes to cycling right now. I’m not yet ready for the Ironman training. 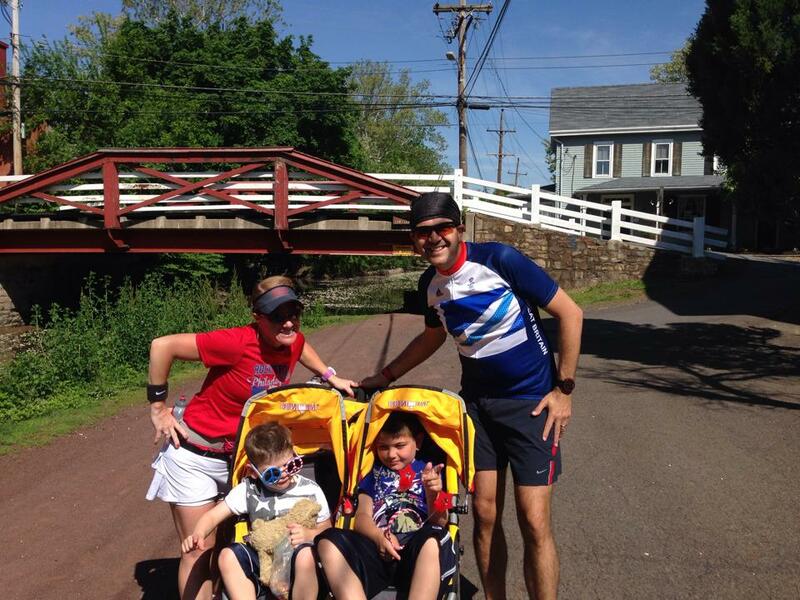 Memorial Day was also the last time we did a family run with our double stroller. The boys are just too big. We bought the double stroller back in 2012 so that my wife and I could both run together with the boys. We have put on well over 150 miles running together with the stroller including three 5K races as well as a couple of long vacation runs. We figured that the boys were on the cusp of the weight limit at the end of last summer but held on to it over the winter. We took it out on Memorial Day and I just couldn’t keep up with my wife. My boys are getting bigger and we were not able to keep up with each other. It was time for it to go but we had some great times running and a lot of fun. It went to a good home. As you can see, the boys are big enough to push me. With the good results of the medical procedure behind me I can now concentrate on other matters. One thing I wanted to look at since I PR’d at the New Jersey Marathon is a chance to better it. I think I can do it. I signed up for a local marathon held in late summer on a flat and fast course along the Delaware Canal Towpath. It is in August so there may be some heat to deal with but that is my goal and after that I can enjoy Baltimore and then Goofy with my wife. 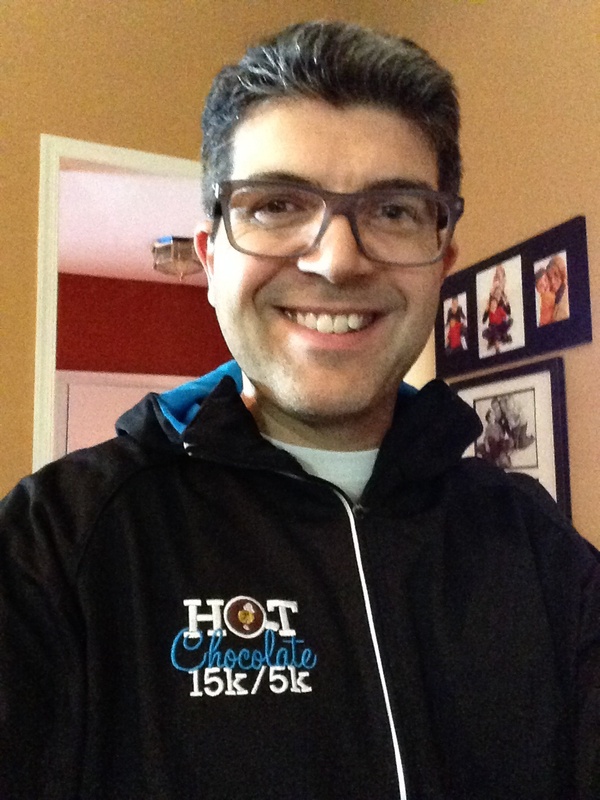 I’ve also signed up for the Gary Papa Father’s Day 5K in Philadelphia. I ran this back in 2012 and this is still my 5K PR (23:31) although I don’t run many anymore. 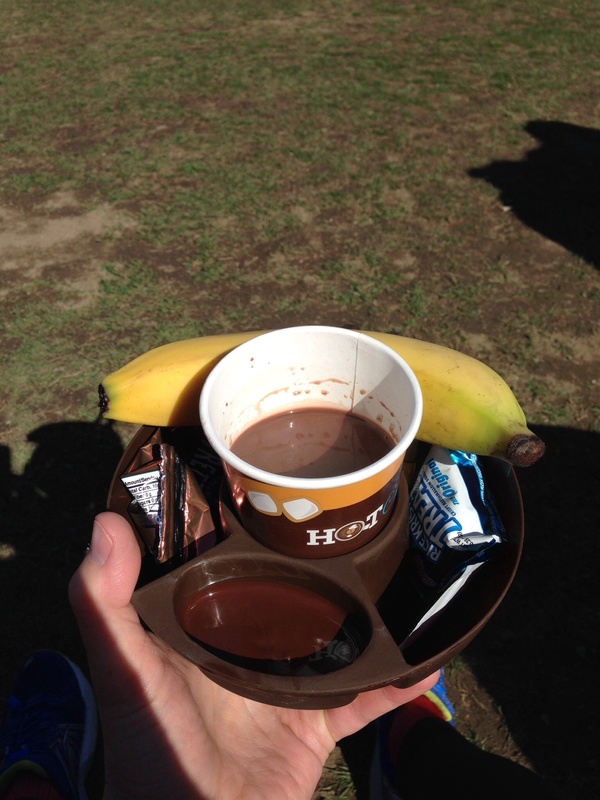 I haven’t decided if I am going to race this for a PR or do this for fun. We shall see how I feel closer to the date. 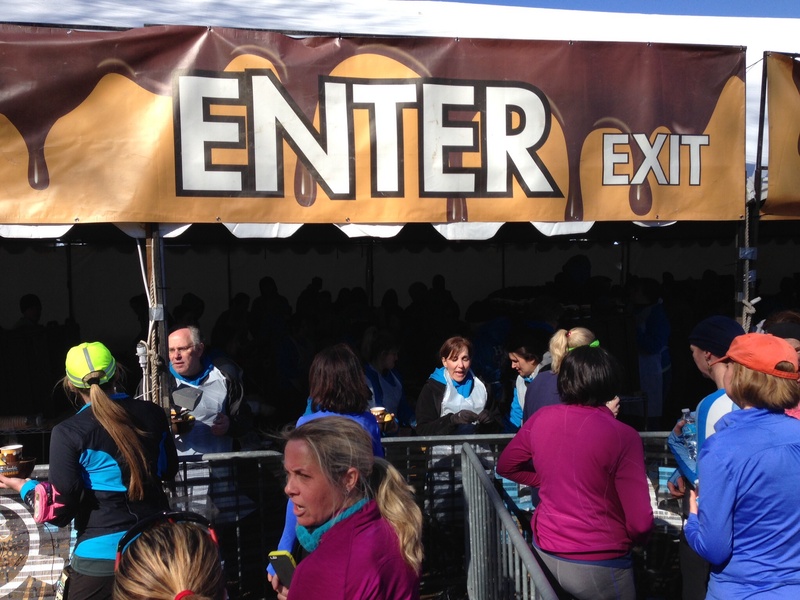 It is a good fundraiser for prostate cancer awareness and draws a large number of entrants. 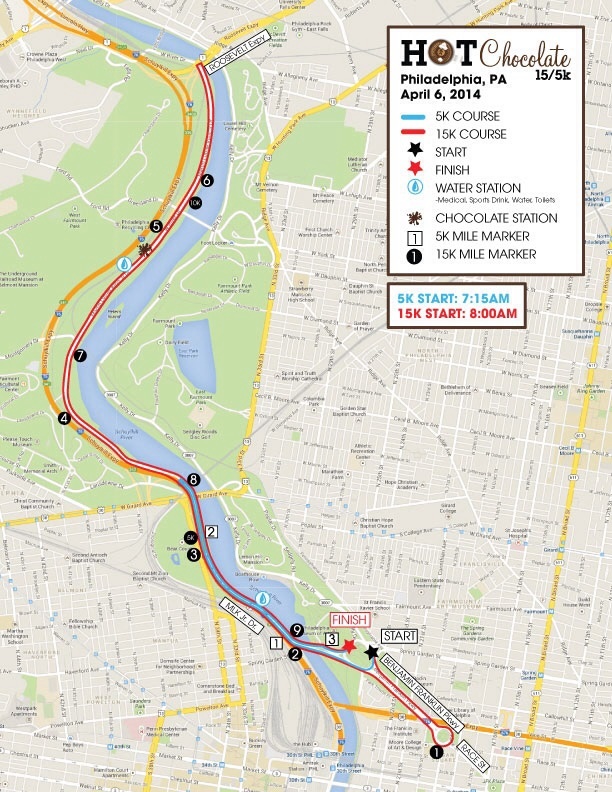 It is a fairly flat and fast course down by the Philadelphia Museum of Art. That is coming up on Father’s Day (June 15). 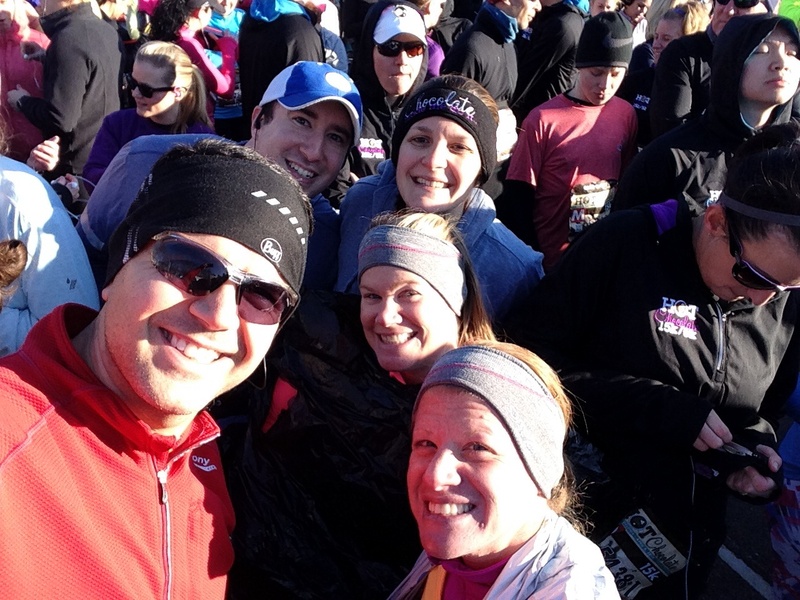 Also, I finally I decided to sign up for a race that I had been tempted to in the past but had not done yet. A midnight 8 miler in July as part of the ‘philadelphia#in24‘ series of races taking place along the banks of the Schuylkill River in Philadelphia on July 19 through the 20th. It is a 24 hour event featuring an ultra marathon, a relay challenge, a midnight run and a 5K. Should be fun. I’ll be there all lit up in lights and reflective gear. I have a pretty busy season coming up and lots to look forward to. It’s not all running though. As much as my wife and I pack in with our training and racing we still have plenty of time for our boys. There is a swimming pool in our development for those hot summer afternoons, we just bought a trampoline so our kids can tire themselves out (hopefully) as well as memberships at Sesame Place, the Adventure Aquarium in New Jersey, the Philadelphia Zoo and the Academy of Natural Sciences in Philadelphia (thank you Groupon for all you do!). We are also planning a weekend in New York City with the boys and are planning a trip to the Statue of Liberty. 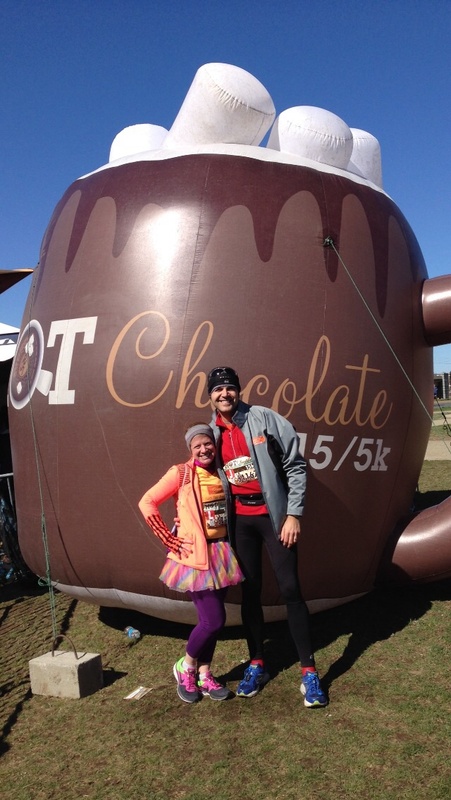 As I said, running is just part of our lives…not all that we do. Thanks for reading. Hope you are having a good start to the summer.